Series takes Moccasin Flats, Saskatchewan to Park City, Utah. Starring a cast of first-time actors, RepREZentin’ In Moccasin Flats screens at Sundance. Jen Podemski of Toronto-based Big Soul Productions talks about giving aboriginal youth a voice on television. Cut from a rural landscape, the horizon punctuated by the shell of a tepee, to the skyline of a city, working-class houses on urban streets. In a yard behind a worn-down house, a girl sits on a torn-up couch, nursing her baby; in a secluded alley, a young man slaps a woman and throws her against a wall; in an empty schoolyard, a gang swarm a boy and kick him to the ground; in an abandoned car, a teenage prostitute goes down on a john, while her friend stands guard duty. The show is RepREZentin’ in Moccasin Flats, a half-hour teenage drama set in urban Saskatchewan. It is to be the first dramatic TV series on ground breaking Canadian cable channel APTN, and the first in North America produced from an all-aboriginal perspective. The project is is as much about community activism as it is television. Headed by Podemski, the Big Soul team left their Toronto studios for the streets of Saskatchewan, building the series around what they found. None of the stars are professional actors; they’re real kids from Moccasin Flats. The script is written after the actors have been cast, and the stories often come from interviews with the kids. The team spends four days or five days workshopping, with each group assigned an industry mentor. Big Soul has mounted productions of RepREZentin’ twice before, but they knew this time was different. Working with the kids is great, she says, because by the time Big Soul arrives in town the hard work has already been done. Community leaders are often reluctant to take the plunge. “The most important thing for me is that my future generations feel really cool and empowered to be native, rather than ashamed or embarrassed about it. I want people to understand that you can be urban, and funky and cool and still be connected to your roots and your history.” It was that goal that provided the base for Big Soul’s first series, The Seventh Generation, now in its third season. Each episode of the half-hour show features profiles of young Aboriginal achievers and casts a positive light on their activities. The show casts a wide net, with episodes dealing with topics as diverse as business, politics, engineering, technology and the Arts. “They see people who are like them in situations that they may want to be in,” says Podemski. But the producers are also aware of their other audience – non-natives. One of their main goals with Seventh Generation was to create a show with universal appeal, one that breaks down stereotypes and preconceived notions. Launched in 1999, APTN is a uniquely Canadian endeavour, providing First Nations, Inuit and Metis people with an opportunity to share their stories to huge native and non-native audiences. Available to all basic-cable subscribers in Canada (and via satellite in the US), it is community-based television on a national scale, presenting a full range of programming including news and documentaries, cooking shows, cartoons and, with RepREZentin’, dramatic series. According to Podemski, the creation of APTN has given confidence to aboriginal producers, resulting in major growth in the number of projects being created from a native perspective. But as far as the mainstream film and television industry is concerned, things haven’t changed much. It was in The Rez that Podemski first made waves on television (the title is slang for “Reservation”). 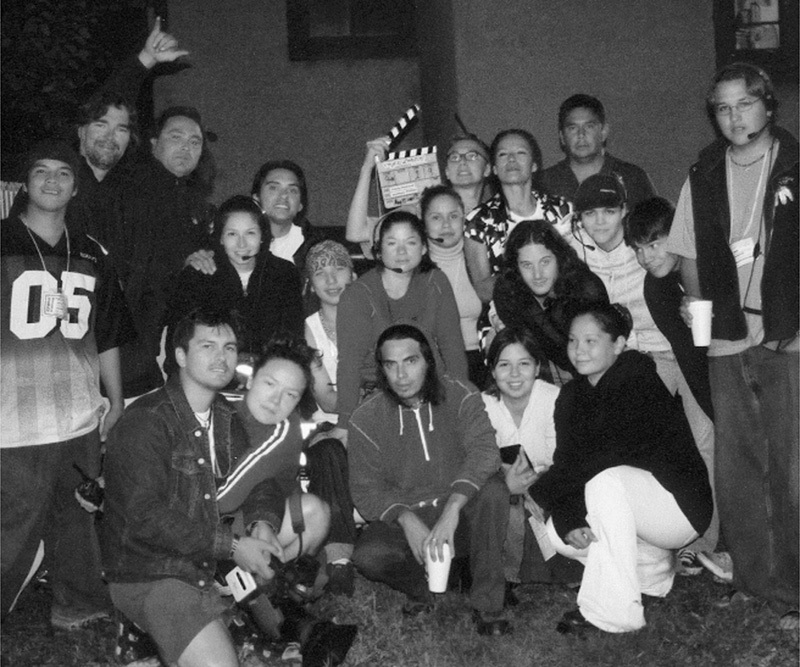 Premiering in 1996 on CBC Television, the show was a springboard for many young aboriginal performers, including Adam Beach, Darrell Dennis, and Jen’s sister Tamara Podemski. Even after three years in business, it’s the pervasiveness of those attitudes that keeps the Big Soul crew coming in every day and staying late. But in the midst of her ambitions for Big Soul, it is increasingly difficult for Podemski to find the time to do what she is best known for – acting. But she does manage to squeeze in a few projects – recently acting in the Big Soul-produced short-film Laurel, an episode of the new TMN series Bliss, and a spot on Degrassie: The Next Generation. Big Soul’s next project will be another RepREZentin’, this one set in Toronto. Artist/Filmmaker Kent Monkton will be writing and directing the pilot this spring. “Our story is going to be about two spirited, homosexuals – one from the city, one who’s just come from the rez – the kind of stories that we grew up with,” says Podemski. But she’s already thinking bigger, and wants to produce a feature within three years. And while she has her hands on a couple “perfect scripts,” the young company will have to weather its growing pains. Production stills from Reprezentin’ in moccasin flats, courtesy Big Soul Productions. Catch Moccasin Flats on APTN and Saskatchewan Communications Network; The Seventh Generation can also be seen on CLT and Access.